The Pondok Indah House was designed by René Tan and his colleague Jonathan Quek for an Indonesian businessman who is an art collector and avid golfer. 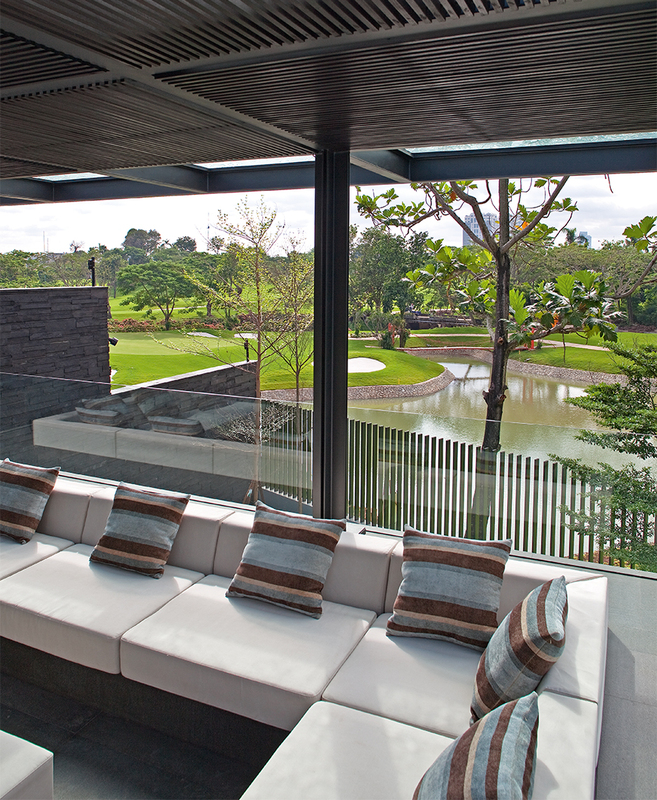 The house is situated on the fringe of the Pondok Indah Golf Course and overlooks a water obstacle in front of the twelfth green. The house is approached from a spacious vehicle court up a slight incline and a broad flight of stairs to the entrance foyer that incorporates good feng shui. A sharp right turn followed by a sharp left turn reveals a dramatic vista along a north-south axis. The axis is accentuated by a linear water garden culminating in a view over an infinity swimming pool to the golf course. The plan is essentially an H form, with two liner blocks on either side of the central north-south axis connected by a bridge at first-floor level. The eastern wing consists of a spa, AV room, breakfast room, dry kitchen, vertical circulation, sitting room and a huge double-height formal dining room with 7.2 metre high sliding doors, extending to an external deck at ground level. The western wing consists of a music room and a formal living room at the same level; a timber deck connects the two wings. At the end of the western wing is a waterfall and a fitness court at basement level. At first-floor level, the east wing contains two bedrooms and a family room, while the west wing contains the master bedroom suite. 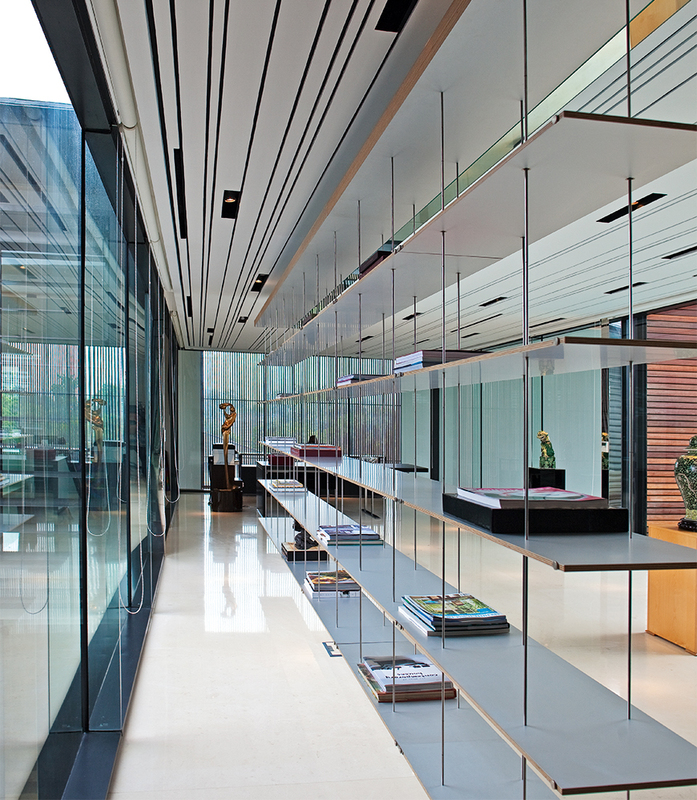 A refined glazed bridge housing a gallery, a library and separate study rooms for parents and children connects the two wings. Natural ventilation is introduced utilising the Venturi principle. The house is a truly dramatic composition. The configuration on the site is challenging, yet helps to create a distinctive plan form; it is a spatial composition of consummate artistry. The junctions are articulated brilliantly and materials are chosen with care. The external landscape complements the mood of each space and the architect created a water garden that is very much in the spirit of Javanese palaces. The dining room and the formal living area are both huge, yet the house also has a sense of intimacy and calm. This article was published in the November 2016 issue of Inspire Living Magazine. Download it here!